The various smoking spots at Mayakoba overlook beautiful canals and a tropical lagoon. Hyatt’s new resort with cigar-friendly views in “The Venice of Mexico." With pristine beaches, the world’s second-longest barrier reef, stunning Mayan ruins and great golf, the Riviera Maya isn’t just one of Mexico’s best vacation destinations—it’s one of the best on earth. It’s also very easy to reach, just 30 minutes south of the relatively new and state of the art Cancún International Airport, with lots of non-stops from all over. If there’s any drawback to the region it would be the lodging scene, most of which is at giant all-inclusive resorts, many of them budget oriented. Fortunately, there is one big exception, and that is Mayakoba, a luxury, master-planned resort community in the mold of top Hawaiian golf and beach resorts like Kapalua and Wailea. 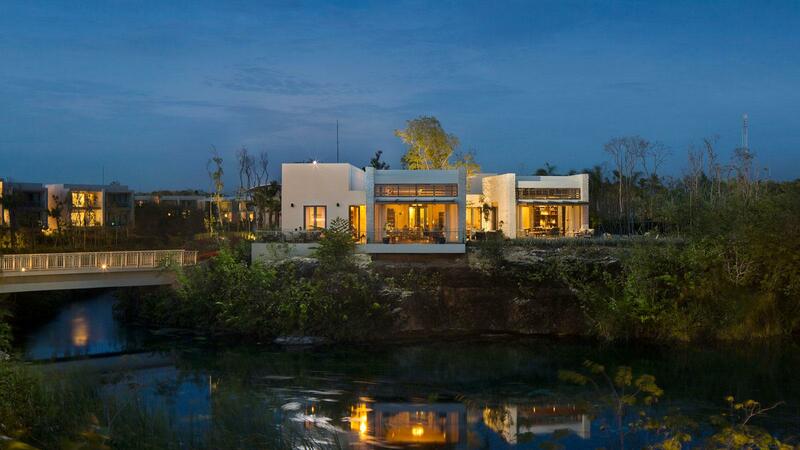 Mayakoba has a Greg Norman designed golf course that hosts the only PGA Tour event in Mexico, a new village center with shops, eateries and a cooking school, and four upscale resorts, including a Fairmont, Rosewood, Banyan Tree and most recently, the Andaz by Hyatt. 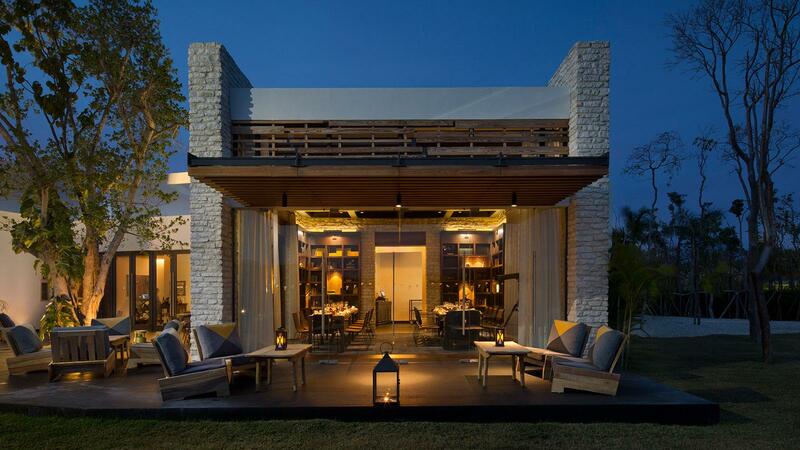 Less than a year old, the Andaz is the newest and final lodging component that completes Mayakoba, and in many ways it’s the best—especially for cigar lovers. Casa Amate's outside deck, where the cigar smoking takes place. Casa Amate, Spanish for "house of the fig tree," is one of the resort’s four restaurants. The space, which won a prestigious interior design award as the best in all of Latin America and the Caribbean, is split into several home-themed dining areas. There’s a living room, dining room, library, and so on. The craft cocktail bar and cigar humidors are located in the sitting room. The namesake tree grows through a vast outside deck—this is where the cigar smoking takes place. Two of the more formal dining rooms also have their own terraces with smoke-friendly tables. An intricate man-made canal network plied by silent electric tour boats has earned Mayakoba the nickname “The Venice of Mexico,” and the various smoking spots here all overlook one of the most beautiful canals and a tropical lagoon. 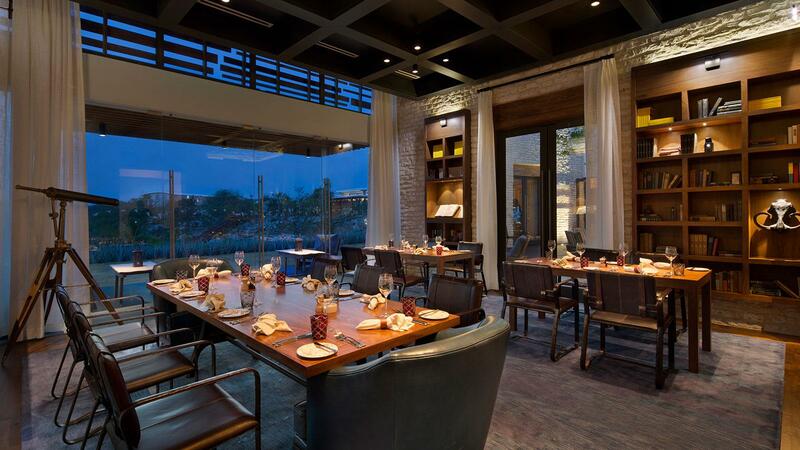 The restaurant won a prestigious interior design award as the best in all of Latin America and the Caribbean. Because the hotel has two beachfront Mexican restaurants specializing in ceviche and tacos, respectively, Casa Amate takes a different tact, with a more gourmand and delicious Central American theme, offering upscale specialties reflecting the regional cuisines of Guatemala, Honduras, Nicaragua and Costa Rica. The cigars, on the other hand, are almost all Cuban. It’s a small but well-curated selection with a couple of choices each from Cohiba and Partagás, alongside several one-off picks such as a Sancho Panza Belicoso, Vegas Robaina Unico, and Hoyo de Monterrey Epicure No. 2. The priciest on the list are the Cohiba Maduro 5 Mágicos and Genios. All have recommended spirits pairings, mostly from the bar’s deep list of Tequila, mezcal and rhum agricole. 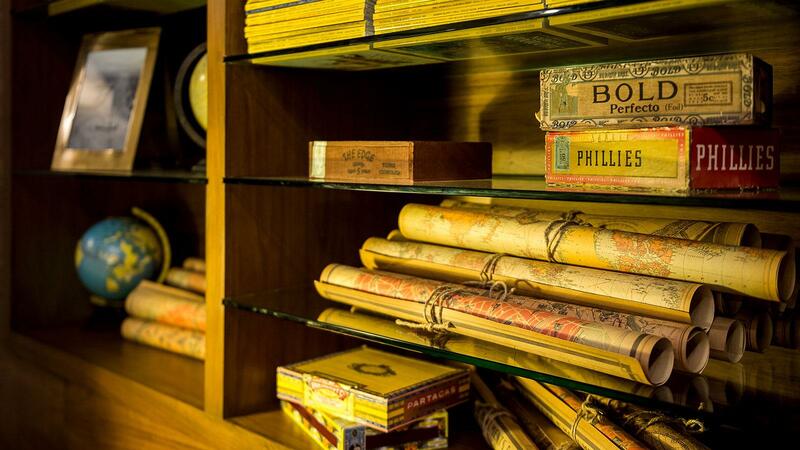 The decor includes vintage maps, spirits and cigar boxes. A Cuban cigarmaker comes in once a week to demonstrate rolling. Casa Amate also recommends their private label Patrón Tequila, bottled from a single cask and aged in a mix of French and American Oak. There are plenty of other choice smoking spots around the sprawling, low-rise resort, as every one of the 214 rooms and suites has a nice private terrace, and the beach is stunning, on par with any luxury hotel sand on earth. It’s a broad expanse with full service, oversized for the hotel’s capacity, and fronts a sheltered bay with a smooth, sandy, gradually-sloped bottom. The golf course, El Cameleon, is named for the way it constantly changes character in Chameleon-like fashion with coastal, canyon and mangrove sections. The Library room is one of several home-themed dining areas. Andaz is Hyatt’s newest brand, a luxury boutique model with a focus on sense of place, similar in quality to the top-tier Park Hyatt brand, but a little bit smaller, hipper and livelier. There are currently 17 Andaz properties worldwide, with several more on the way. 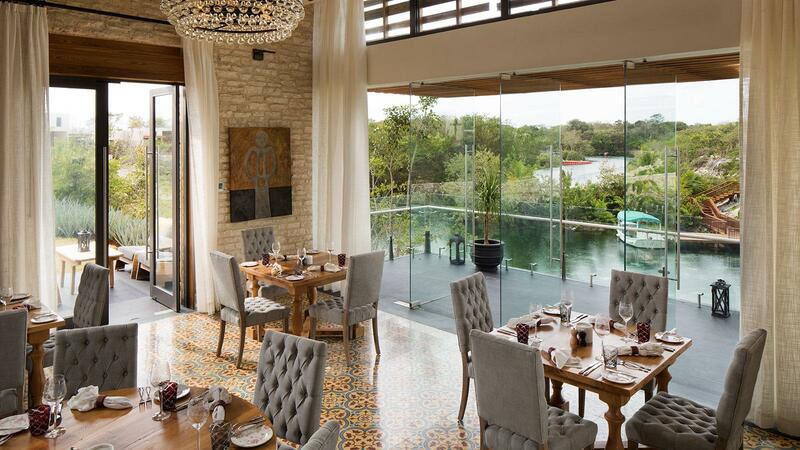 Anyone unfamiliar with the brand will be pleasantly surprised at Mayakoba, as this is an exquisite resort in a beautiful setting, with great rooms, great food and attentive, friendly service. Open Tuesday through Saturday: 6 p.m. – 11 p.m.
Open Sundays 11 a.m. – 3 p.m.